Indonesia Comic Con 2017 firmly underway right now, Indonesia’s very own Silvia Tampi has unleashes a few more, Fudog Warriors! Four variants not including our very own TTC edition which you can check out HERE. Crazy colour schemes and themes all best to see in person as Silvia tries various colour applications and finishes homing in on her airbrush skills. Aqua and galaxy are painted by airbrush by Psycho Custom. 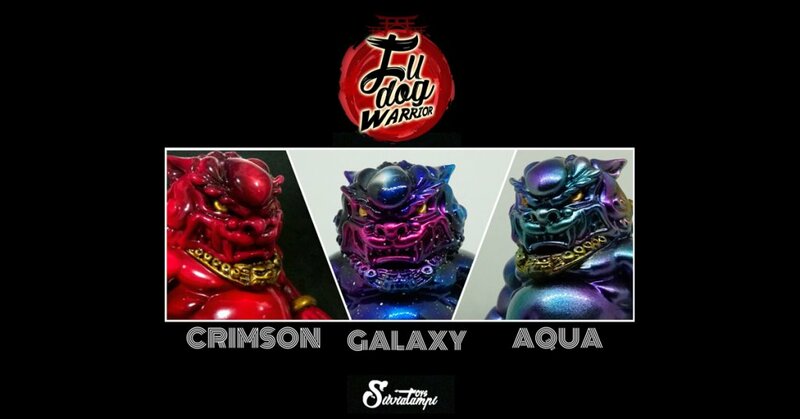 Silvia Tampi x Psycho Custom presents to you Eclipse, Ancient, Crimson, Galaxy, and Aqua Fudog. The Eclipse Fudog and Ancient are ICC special, each only one pair worldwide and The Crimson are 5 pairs worldwide. But nowadays, the world need not only just as a symbol. So they transform and live among us to keep the balance and to protect the world from the darkness. They transform into a human body and adjust their appearance. Who knows maybe you accidentally meet them and they will give their blessing to you. They stand 5.6 inches tall (14 centimetres). The Eclipse Fudog and Ancient are ICC special, each only one pair worldwide. The price $250/pair. The Crimson are 5 pairs worldwide $220/pair. HOW TO BUY: Email [email protected] or DM Silvia Tampi via Instagram if you’re interested. Tell Slivia The Toy Chronicle sent you. Check out the Stone Edition below with a pre-order. 28 – 29 OCT 2017 – Jakarta Convention Center. Find Silvia Tampi via Instagram and Facebook.